One 97 Communications Ltd, which runs mobile payments and e-commerce platform Paytm, has received commitment of $60 million (Rs 403 crore) from Taiwanese chipmaker MediaTek Inc.'s Mountain Capital fund as part of its ongoing fundraising exercise. A person directly familiar with the development told VCCircle that Mountain Capital LP is the lead investor in this round. Existing investor Alibaba Group is also likely to put in at least $60 million in this round, the person said on the condition of anonymity. Interestingly, MediaTek recently invested in Paytm's arch rival MobiKwik. In May, MobiKwik raised $50 million in its Series C round led by Japan's GMO Payment Gateway and MediaTek. Paytm is issuing shares at Rs 6,650 each, valuing it at $4.8 billion (Rs 32,250 crore) post money. The company's board took up the proposal at a meeting on Monday at its Noida headquarters. This would mean a big jump in valuations. Last month it issued shares worth Rs 85 lakh each to three new board members--Naveen Tewari, co-founder of InMobi; Neeraj Arora, global business head at WhatsApp; and Ruchi Sanghvi, first female engineer at Facebook; at Rs 3,300 each, the company's filings with the Registrar of Companies reveal. Alibaba, along with its payments arm Alipay, owns around 41% of One 97 and is the single largest shareholder of the firm that operates Paytm. The person cited above did not share more details on the parentage of Mountain Capital. An email to Paytm founder Vijay Shekhar Sharma did not elicit any response at the time of filing this report. Update: Later during the night, Sharma told The Economic Times that MediaTek through Mountain Capital had invested in Paytm, as first reported by VCCircle. At a recent TechCircle event, Sharma had said that there was a perpetual investor interest in Paytm and that he declined investment offers on a regular basis. Earlier in the day, several media reports said Paytm was raising as much $350 million (Rs 2,350 crore) in a fresh round of funding valuing it at $5 billion. The company was reportedly talking to a clutch of potential investors that also include Singapore state investment arm Temasek Holdings Pte, Goldman Sachs Inc, Taiwan's Foxconn and Singapore's sovereign fund GIC Pte. Existing investors Alibaba Group and SAIF Partners would also participate, the reports said citing unnamed people. The person who spoke with VCCircle said that Temasek, Goldman Sachs and MediaTek may come as investors on board this time. However, the final commitment from them is yet to come. According to him, the company is likely to raise $250-300 million in this round. Large funding round If and when raised, the amount would be one of the largest fundraising exercises this year in India's consumer Internet segment. The deal assumes significance as it comes in a constrained funding environment. Many startups have been struggling to raise funds, and even more established names such as Flipkart and Snapdeal are no exceptions to this trend. Paytm is also spinning off its e-commerce business as a separate unit even as existing investor Alibaba is trying to enter India either independently or through an acquisition. Paytm has created a new entity called Paytm E-Commerce Pvt Ltd for this purpose. Alternatively, Alibaba is reportedly mulling as to whether it should put money directly into the parent company One 97 or buy stakes in Paytm Payment Bank Ltd and Paytm E-commerce, according to Mint. Paytm, which is one of the 11 applicants that received in-principle approval for a payments bank licence, is likely to launch the business during this festive season. In February, it had hired former RBI executive Shinjini Kumar to head this arm. 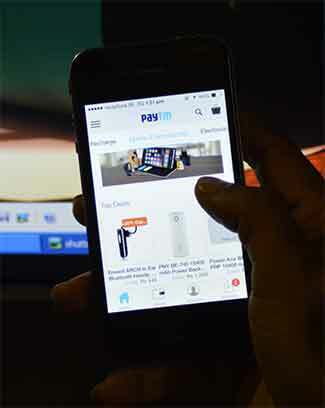 For the year ended March 2015, Paytm reported net sales of Rs 323 crore. However, its expenditure more than tripled to Rs 674 crore and it registered a net loss of Rs 372 crore, according to data available with VCCEdge. Paytm is considered the market leader in the mobile payments space followed by MobiKwik and with Snapdeal-owned FreeCharge snipping at its heels, according to media reports. The high potential investor interest in Paytm could also probably be attributed to the fact that India is taking baby steps toward a shift to a cashless economy. Paytm's closest rival in its core business of mobile wallets, MobiKwik, raised $40 million in a fresh round of funding from South Africa's Net1 last Friday. However, Paytm is a small player in the e-commerce market, which is dominated by Flipkart, Amazon and Snapdeal. This article has been updated with details of the lead investor Mountain Capital.